Home › What is a Billiken? I have received many e-mails asking me “What really is a billiken?” Well, this page is here to answer that question. For the previous paragraph I would like to greatly thank Ranney Dohogne, Class of 1962. 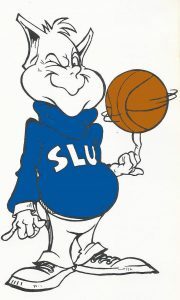 Also there is the definition that SLU has posted on their site which states that the Billiken was considered a good luck charm during Billikenmania in 1909 and 1910. Later on in 1910 a sportswriter, William O’Connor, thought that the face of John Bender, a SLU football coach, resembled the billiken. And with that the face of the Billiken was posted in a drugstore window and the SLU football team became known as Bender’s Billikens. From then on the name just caught on. Also the Billiken has no specified gender.